Tracking IP trends and trying to guess the future is always tricky. Occasionally I follow the global IP news led by the idea “do not miss the next big thing”. On the contrary, my current client workload adjusts my feelings and market forecast. No wonder you hear different opinions from IP practitioners. The year 2016 gave us slight optimism for growth. IP driven start-ups requested legal advice about protection of their IP portfolio, IP assignment in favour of US-based assignees (co-investors). Business goes online and requires development of mobile apps; the total number of IT/IP services is on the rise. At the same time, online IP infringements are also increasing, and some of them are difficult to stop. In this respect, we hope that the new Law On State Support for Cinematography will enable extra options for locating infringers and stopping online infringements. We observe growth in the number of IP-related unfair competition cases considered by the Antimonopoly Committee. Applying to the AMCU is a simpler and cost-effective alternative to dispute resolution. The total number of IP disputes by local commercial courts is just 680 cases (compare this to 30,881 bankruptcy or 61,364 contract disputes). The officially reported total value of IP disputes in these courts was about UAH 80 million in 2016. This figure looks misleading. The majority of disputes pertaining to TM or patent cancellation are the “no value” type; the actual value of the contested IP is left behind the scenes. (1) Institutional transformation. The Ministry of Economic Development and Trade will substitute the State IP Service in its role as patent and trademark office. (2) Court reform. The High Court on IP Matters will start to function this year. (3) Parallel imports issue. The proposal to shift the international principle of exhaustion of IP rights for TM to the national principle is one of most controversial IP issues on Parliament’s agenda. The IP powerhouse Pakharenko & Partners is consistently referred as a very well positioned top player on the Ukrainian market. The firm is widely known for handling the full spectrum of IP matters, especially anti-counterfeiting and anti-piracy measures, complicated IP infringement matters, trademark and patent cases. Among recent landmark projects is protecting the interests of LRC Products Limited by stopping the illegal use of the TM “SCHOLL” in 43 cases associated with the dissemination of counterfeit/falsified products throughout the year. The firm is enlisted to support the portfolio of IP rights for such regular clients as CHANEL SARL, Pernod Ricard SA, DRISCOLL STRAWBERRY ASSOCIATES, Inc. In 2016 the firm supported a number of criminal cases related to violation of trademarks belonging to companies like Chanel SARL, Gucci Gucci SPA, Burberry Limited, Hugo Boss Trade Mark Management GmbH & Co. KG. KG, Tommy Hilfiger Licensing B.V., Giorgio Armani S.p.A., NIKE Innovate C.V., Syngenta, Procter & Gamble Company, Reckitt Benckiser N.V., Moncler S.p.A. and a further 25 world-famous brands. Highly-respected Antonina Pakharenko-Anderson, managing partner, is an outstanding person in Ukraine. Alexander Pakharenko is traditionally acknowledged by IP community for his anti-counterfeiting and anti-piracy proceedings. Elena Shamrina and Evgeniy Kompanets are other core team members. Patent and law agency Doubinsky & Osharova is a universal firm for solving IP issues, right from assessing the chances of registration of objects to creating a strategy for IP portfolio, from monitoring violations to the development of a full-scale strategy for the protection of rights. The agency has traditionally had a multi-faceted practice: protection of IP at customs; management of administrative cases; conducting criminal proceedings and litigation; mediation; consultancy; claim settlements; management of out of court cases in recognition of well-known trademarks; IP audits; anti-counterfeiting; forced re-delegation of domain names. The team successfully defended the IP rights of the state-owned bank Oschadbank in a court case in the High Commercial Court regarding early termination of the certificate of Ukraine on the sign “Sberbank” for goods and services of PJSC Oschadbank. It also defended the IP rights of the largest oil and gas corporation in the world, Exxon Mobil Corporation, in cancelling an action against a trademark confusingly similar to the trademark “Mobil 1”. It also defended the rights of The Coca-Cola Company in a case regarding unfair competition actions. Another significant case is acting for Bunge in the case regarding prohibition of use of the “Oleina” trademark, designations confusingly similar to trademark and delegation of domain names oleina.com.ua. and олейна.com.ua. Michael Doubinsky, managing partner, is often referred as a market authority. Yaroslav Ognevyuk, partner, is known for his strong litigation skills, supplementing experience in all IP matters. Partners Victoria Sopilnyak and Anton Koval are among the key practitioners. Proactive AEQUO stands out for its strong IP litigation practice, with a standalone team dedicated to disputes in this area as well as a full-service non-contentious IP practice, handling trademark and patent prosecution, copyrights, day-to-day advisory work and transactional support. The firm defended Dr. Reddy’s biosimilar product in the High Commercial Court of Ukraine in a “first of a kind” case; and represented Forbes Media in a number of issues related to its American Arbitration Association arbitration proceeding against United Media Holding N.V., Forbes’ former licensee in Ukraine, in the termination of its license agreement as well as in proceedings claiming access to the forbes.ua domain name in Ukrainian courts. Oleksandr Mamunya, partner, head of dispute resolution and IP, is constantly named among leading IP lawyers in Ukraine. Andrey Nikolayenko, senior associate, is highly active across complicated IP project work. Baker McKenzie is a strong hub that provides the full spectrum of services and solutions to protect, manage and enforce the IP rights of international and local companies. The IP group focuses on comprehensive services in connection with structuring transactions related to intellectual property and information technologies, securing IT rights, including registration of trademarks and patents in Ukraine, and protecting against unfair business practices. The IP clients portfolio of the firm includes 3M Company, NISSAN, Total SA, Columbia Sportswear Company, Starbucks Corporation, Alticor Incorporated, Moёt Hennessy and others. In particular, the team recently acted for NISSAN in a number of trademark prosecution, clearance and trademark opposition cases and represented Columbia Sportswear in a major anti-counterfeiting criminal case in Ukraine. Practice head Ruslan Drobyazko, partner, has extensive experience of providing comprehensive services related to IP. Yuliya Kolchenko and Oleksiy Stolyarenko are the key practitioners visible in the market. Sayenko Kharenko’s strongly established IP team is proficient in transactional advice, non-contentious matters and high profile IP litigation. The key highlights include advising Shanghai Giant Network Technology Co. on the IP issues related to the acquisition of Playtika Ltd; maintaining regional patents portfolio of NOVOMATIC AG; representing interests of Porsche Ukraine with respect to protection of VW, AUDI, SEAT brands in Ukraine. The team recently acted as legal counsel to CONSORZIO DI TUTELA DELLA DENOMINAZIONE DI ORIGINE CONTROLLATA PROSECCO with respect to protecting the PROSECCO brand in Ukraine against unfair competition and unlawful use of the brand; as well as maintaining local trademark portfolio of Podravka d.d. Selected clients include Consortium of PROSECCO wine producers, Electronic Arts, NOVOMATIC AG, Porsche Ukraine, Vostok Games. Partners Oleksandr Padalka and Nazar Chernyavsky, senior associate Oleg Klymchuk are primary IP contacts at the firm. Arzinger boosted its IP practice in 2016, providing comprehensive offering related to IP turnover and advises on a wide range of commercial arrangements and transactions with IP objects, including taxation. The client portfolio includes prominent names in pharmaceuticals, construction and development, electronics, telecommunications, energy sectors. In the outgoing year the firm represented a leading manufacturer of industrial equipment in a case relating to combating the import of grey and counterfeit products by different companies into Ukraine. This included development of brand protection mechanisms, and advised the international organizer of retail exhibitions concerning the issues of late trademark renewal procedure envisaged under Ukrainian legislation. The team rendered advice on the use of names of places of origins and geographical indications for mineral waters in Ukraine. Counsel and head of IP Kateryna Oliinyk enjoys a growing reputation in the IP community. Asters utilizes hands-on IP experience, both stand-alone and arising from other practices, including M&A, IPOs, securitizations, private placements and other corporate and finance transactions. Notably, the firm is often involved in complex IP projects. In 2016 represented Сar-Freshner Corporation in trademark infringement actions regarding unlawful use of clients trademarks; and also advised Ferrero S.p.A. in connection with pre-trial negotiations and dispute resolution in connection with the unauthorized use of “Nutella”, the famous client’s brand, by a local confectionary producer; and represented The Foundry Visionmongers Limited in matters regarding the unlawful use of computer programs, including representation before the law-enforcement authorities, negotiations with the infringer regarding purchase of licenses. Julia Semeniy, the lead partner, is widely renowned in the IP community. The Kyiv office of DLA Piper commands a stand-alone IP practice with a diverse clientele including e-commerce, IT and technology, luxury brands. In a recent highlight the IP team rendered legal advice to the Norwegian Seafood Council with regards to registration of a trademark in Ukraine, and trademark licensing matters; advised Conair Corporation on several trademark protection matters. The workflow includes complex projects such as IP structuring and IP audit, IP rights and asset transfer matters. Clients include Bacardi Limited, Nike, Inc., Nu Mark, Norwegian Seafood Council, Conair Corporation, Naspers, Porsche AG. Partner Natalia Pakhomovska, head of IP and technology in Ukraine, had a busy year. IPStyle Patent Law Company is a full-service IP boutique operating both in Ukraine and abroad. The firm provides for complex management of portfolios for companies including industry leaders and the protection of IP rights worldwide. Among the clients in 2016 are ASHAN, DANONE Ukraine, ROSHEN Confectionery, NOVUS, Nova Poshta, WINNER, Forward Bank, Import Foods, Prolego, Mitek, LOL&POP, IDEO GROUP. One work highlight was ensuring the broadest protection of the IP rights of ROSHEN in Ukraine and whilst operating on foreign markets, including protection at customs, and advising on various complex IP matters. The firm develops its IP litigation department tremendously, and has already won a number of cases representing clients in courts and other judicial authorities. In this past year IPStyle opened a Polish desk for providing services for Polish clients in Ukraine as well as for Ukrainian clients who intend to operate in Poland. Proactive Mariya Ortynska, patent and trademark attorney, manages the team. Vasil Kisil & Partners has by tradition an experienced IP practice. The firm advises clients through the entire IP life cycle, from the development of IP strategies, searches and audits, to the filing and registration of IP rights, structuring of related cross-border transactions, regulatory and tax issues, as well as on-going maintenance issues, such as anti-counterfeiting strategies and dispute resolution. Its overhanging IP litigation practice is particularly extensive and handles disputes regarding registration invalidation and IP rights protection, as well as various types of unfair competition disputes. The recent caseload includes representing a Ukrainian client in termination of a trademark/domain name dispute and representing another Ukrainian client in early termination of a trademark dispute with a major international pharmaceutical company. Vladyslav Podolyak, counsel, is the key practitioner. 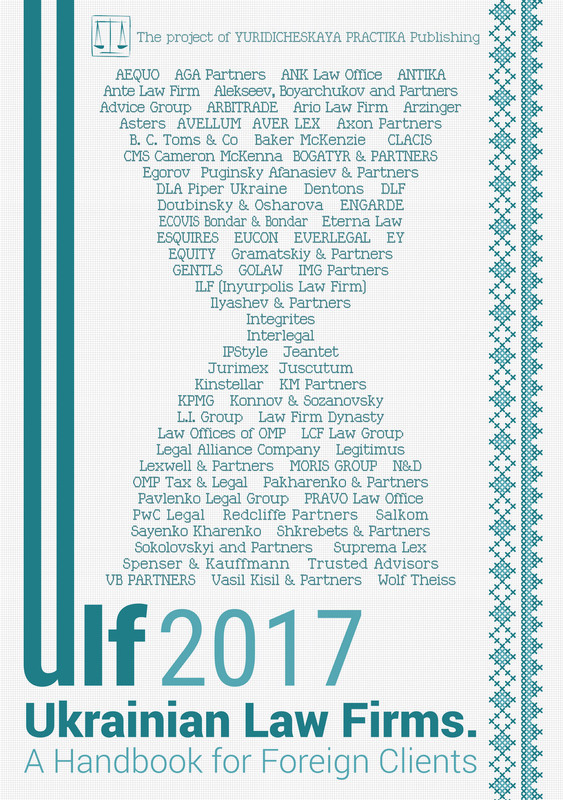 Ilyashev & Partners is primarily known for its dispute resolution skills, particularly IP litigations. Pharma, aviation, foods, cosmetics are part of the team’s industrial focus. Among the recent landmark projects are protection the intellectual property rights for “Mildronate” produced by Grindex in court proceedings. Notably, the firm acted as legal advisor to State Enterprise Antonov in disputes with OJSC Aviakor Aviation Plant and for OJSC Aviakor on recovery of losses under a licensing agreement for the right to use the trademark. Irina Kirichenko, patent attorney, is known primarily for successfully advising pharmaceutical companies. Milkhail Ilyashev, managing partner, oversees the practice. Year on year, the IP team of Egorov Puginsky Afanasiev & Partners Ukraine and its counsel, Taras Kyslyy, is a point of reference among IP practitioners. The firm provides comprehensive legal advice related to registration, transfer, and use of intellectual property rights, including trademarks, inventions, copyright, domain names and defends IP rights before patent, customs and law-enforcement authorities, in courts and international commercial arbitration. The patent and trademark attorneys of Mikhailyuk, Sorokolat & Partners provide a full range of services related to obtaining and maintaining legal protection for patents, trademarks, designs, supporting the transactions and enforcement of IP rights, initiating and participating in cancellation actions against patents and trademark certificates. For example, the team was assigned the trademarks portfolio relating to the coffee industry from Intercontinental Great Brands LLC (Mondelez Group) to Koninklijke Douwe Egberts B.V. within the framework of corporate restructuring. The recent achievements encompass the online service on its website — trademark search for similar or identical marks. Partners Anna Mikhailyuk and Vadim Mikhailyuk are well-known IP practitioners. Senior partner Valentin Mikhailyuk is another recognized name in the IP community. IP Law Agency Synergy comprises of specialists in the field of intellectual property, working in two practices — IP registration and transactions & litigation. The boutique firm provides services in all matters concerning to intellectual property, including legal assistance to the IT and e-commerce business. Moreover, one of the main areas of specialization of transactions & litigation practice is taxation of royalty payments. The team led by partner Anna Kravchuk acted as legal advisor to Vivo Healthway LLC in various IP matters; supported Rozetka.ua in trademark rights violation cases; FreeHost PE in numerous cases regarding protection of trademark. The recognized Ukrainian law firm Konnov & Sozanovsky enjoys a strong legacy in intellectual property and helps its clients to develop corporate IP strategies, programs and policies. The firm stands out for its longstanding practice in copyright and media law. The core figures are Alexandra Odinets and Irina Melika. The local IP boutique Borovyk & Partners is currently undergoing modernization. Olena Kyrylyuk joined the firm as a partner to strengthen the IP dispute resolution practice. The firm handled all the patenting for Alcopack and represented Alcopack in four patent litigation cases; provided legal assistance in protecting trademarks and the domain name of the Porsche Finance Group in Ukraine. It also advised on day-to-day aspects of the use of its trademarks in Ukraine. The team introduced the de-facto administrative patent opposition proceeding, which is formally not foreseen in the current patent legislation. Petro Borovyk, founding partner, is the core contact. Gorodissky & Partners is recognized among leading players in the field of intellectual property rights registration, as well as protection of IP rights in courts and during pre-trial procedures. Oleg Zhukhevych is known on the IP market. Marchenko Danevych is known for its expertise in IP-related matters in life sciences. The firm maintains long-lasting cooperation with global leaders such as Eli Lilly, Johnson & Johnson, Novo Nordisk and others. In 2016 the firm also started cooperation with the EBRD and Gilead in IP area. The team advised the Ministry of Health of Ukraine on development of the medicine registration system, including its IP protection aspects (project initiated and financed by EBRD) as the Ukrainian legal expert within an international consortium; acted as the outside counsel for Gilead in a precedential regulatory/IP case. Borys Danevych is a prime contact. The practice was also strengthened with the arrival of a new partner, Oleksandr Aleksyeyenko. Romanenko joined the firm as head of the IP, IT & data protection practices. Kazakhstan. Serhiy Shershun and Pavlo Loginov are core practitioners, also involved in competition practice. EQUITY (called FCLEX up till June 2017) , in particular, Kyivmedpraparat, NPO Farmatron, Halychpharm. In particular, in 2016 the team led by Oleg Malinevskiy represented the interests of Arterium Corporation in several disputes over the protection of IP rights with regard to the medical preparation “Tiatriazolin”. The team also advised the SOTA Cinema Group on contractual provisions in the process of shooting a film with brand placement. The Kyiv IP team of CMS Cameron McKenna had a vibrant year assisting international companies with IP related matters. The team provided legal services in Ukraine which cover both domestic and cross-border transactions and assignments. It is well regarded in IP litigation and has been acting on a number of confidential cases. Partners Olexander Martinenko and Olga Belyakova are noted as key figures. Dentons’ IP practice is well diversified. The team is particularly active in the field of new technologies, regularly advising on licensing and development of software and software packages, service and maintenance contracts, financing of computer products, database management, protection of software against piracy, and cases alleging unfair competition. The practice also represents numerous clients on Internet issues, predominantly with respect to hosting contracts, licensing online connection facilities, website creation, electronic data interchange (EDI), encryption, e-commerce, copyright infringement, and cases involving operator liability. Oleg Batyuk is a lead partner. Given its industrial niche Legal Alliance Company utilizes experience in protecting both national and international trademarks, patents on inventions, utility models and industrial designs, particularly in areas like pharmaceuticals, medicine, veterinary medicine, pharmacology, immunology, genetic engineering, molecular biology and chemistry. Illya Kostin, partner, and counsel Nataliia Lavrenova, are the firm’s key IP practitioners. Prime in taxation KM Partners provides assistance to clients within a wide range of issues related to intellectual property, from registration of trademarks or plant variety to structuring of complex cross-border transactions related to the transfer of IP rights. The team represents clients in state authorities and courts in tax related matters: license payments as royalty for tax purposes, registration of trademarks in the customs intellectual property registry. Recognized tax advisors Sokolovskyi & Partners provide legal and technological support for the acquisition of IT products, namely, accompany software development contracts, site development, search optimization, SaaS (software as a service) and support for the implementation of information systems and software. The firm drafts contracts for the creation of IP on order, licensing agreements, licenses, transfer of exclusive property rights, as well as protection of IP rights on the Internet and misuse thereof. Counsel Ihor Shevchenko heads the IT/IP practice. The rapidly expanding Ukrainian law firm of Spenser & Kauffmann launched its IP practice in May 2016. Its client portfolio takes in both multinational companies and prospective IT startups. This past year the team, as guided by counsel Tatiana Kharebava, advised several IT startups on the best options to protect IP, including elaboration of different agreements for the transfer and commercialization of IP rights. KPMG Ukraine provides legal support in cross-border registration of changes to registered information with regard to trademarks owned by Marc Cain GmbH; and also advised a national sports organization on the legality and possibility of contributing certain IP and other rights (video broadcasting, sponsorship rights, etc) into the charter capital of the company’s subsidiary. Yuriy Katser, head of legal services, is a key contact. The IP practice of the International Legal Center EUCON is headed by Yevhen Petrenko, recently promoted to partner. In 2016 the firm acted for Global Message Services Ukraine on supporting national and international trademark registration. In 2016 the IP practice of Gramatskiy & Partners brought many significant projects related to both counseling clients and their protection in courts and pre-trial proceedings. A number of appeals from Ukrainian producers were related to the protection of their copyright to industrial design. There were complex franchising, licensing, software development and complex IP objects. The client lists include KSTT Services, Global Universal Trading Ltd, AgroAlliance Group, PTS UA Services, Skywind Tech UA, Playtech Software Limited, Clickmein. Borys Karas heads the practice. SDM Partners has a substantial practice regarding registration of various types of rights to IP objects, protection from infringements (including through the courts, antimonopoly bodies and law-enforcement bodies), advice regarding major deals relating to the sale and purchase/licensing of various IP objects. Serhiy Dzis heads the practice. Aleksey Pukha and Partners acted on behalf DeltaQuest Group for registration of the trademark of the fashion TV in Ukraine. Lavrynovych & Partners provided advice to Sergio LLC on the protection of intellectual property rights against a manufacturer of sweets, which violates the rights protected by patents, and distributors to discontinue the use and sale of goods produced in violation of IP rights. In 2016 Juscutum structured the IP portfolio of Sportlife, protected Miss Internet IP rights during the creation of an international competition. 1 He joined Taylor Wessing Ukraine in May 2017.